My bathroom renovation is still waiting on the shower glass and the custom door, but in the meantime, here's a mostly finished picture showing the sink side, with the shower reflected in the mirror. The bedroom is also finished, and the crowning piece is my new bookshelf loft. The sitting area underneath has tatami mats for a Japanese feel. 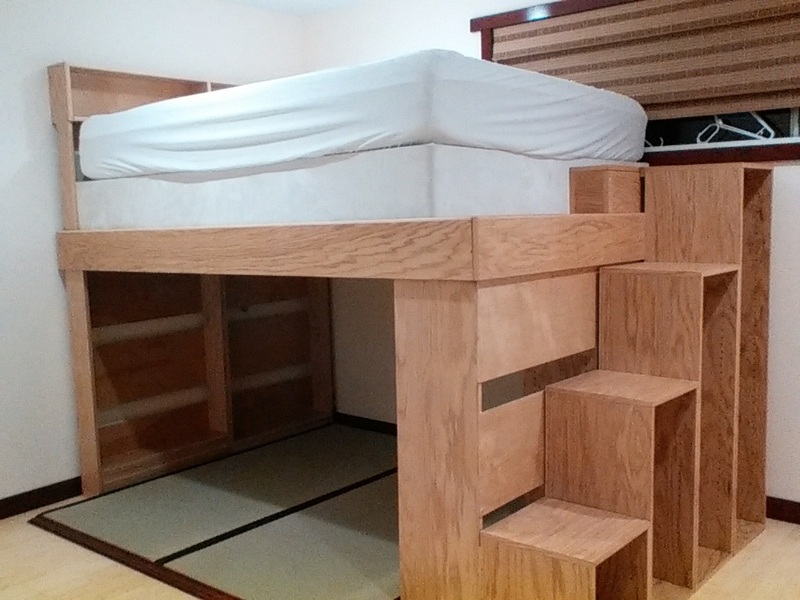 I'll be adding a low table, lights, and some Japanese-style floor cushions. The shelves will be populated with books and solitaire-playable games. Right now, I'm just really glad I can sleep on my bed again rather than the couch. I got my shipment of yarn on Saturday, and I've been experimenting with my new dyeing hobby. My first ball of naturally dyed yarn came out reasonably well. The yellow color is quite pretty...the main flaw is that I don't normally wear yellow, so I'm not sure yet what I'll make with it. I'm sure I'll think of something. 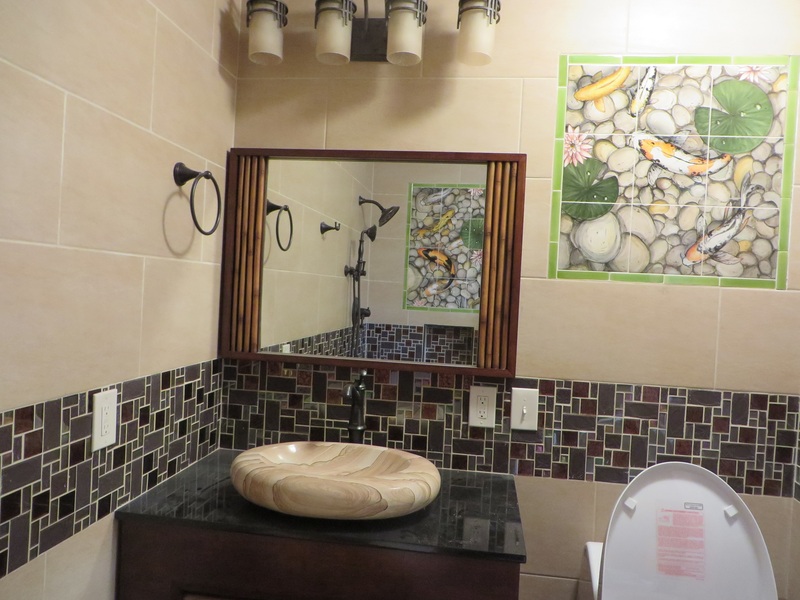 Your bathroom is gorgeous!!! I love your bookshelf loft, too. Though I would bang my head all the time. The naturally dyed yarn is really lovely! It will make a wonderful bright contrast in colorwork or strips! Thanks! I have banged my head on the underside of the loft, but only when I foolishly tried to stand up while still under it. Otherwise, it's actually a decent height. The naturally dyed yarn is really lovely! So far, most of the other dye colors I've been trying have come out some variant of beige. Not bad colors, but I'm still hoping for some richer and/or brighter options. I think I just need to leave things to soak in the dye longer...one author has mentioned leaving the yarn in the dye for as much as four weeks. I haven't yet left anything longer than three days. Look up ChemKnits on Youtube...I can't recall her doing a lot of natural dying, but she might be able to give you some idea as to how to improve your saturation. Although I do recall one comment she made, that you want the 'natural' or 'raw' yarn, not the white, because the white's been bleached so it doesn't take color quite as well. Are the steps bookshelves too? Looks like it to me. Though I'd think the hardest thing about having a bed up high...would be making it. The only hard corner to reach is the one tucked in the corner of the room. The others are actually pretty accessible. So as long as I do that corner first, the rest isn't too difficult. Although I do recall one comment she made, that you want the 'natural' or 'raw' yarn, not the white, because the white's been bleached so it doesn't take color quite as well. 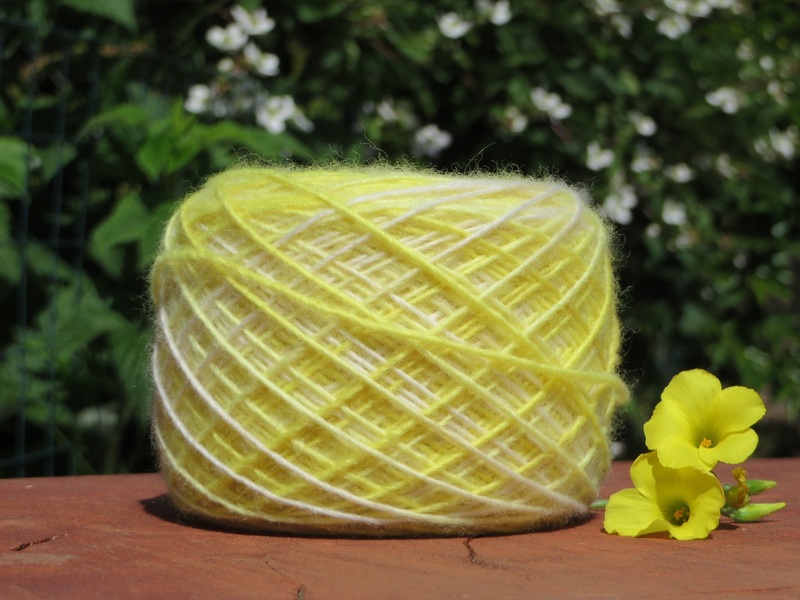 I've been using the "bare" line of yarns from the Knit Picks site. I view this initial batch as purely experimental, so I'm trying a number of different blends and thicknesses. One of the things I'm planning to do on my days off this week is to go down to the bay a few blocks away and collect a few gallons of seawater. I want to see if that produces different colors compared with regular tap water. A lot of the colors are sensitive to pH and various minerals, so the results could be interesting. I've got a garden full of plants to try...my main limitation is finding the TIME for it all. Every step of the process is relatively easy, just time-consuming. Tell me about it! Some days I think I just collect hobbies. I take it the flower next to it is what you used for the dye? Today I got a lovely peachy pink from loquat leaves and light orangish brown from eucalyptus leaves. Still somewhat muted colors, but they're both ones I could see myself wearing.